This is the second domain of the five-domain beta-galactosidase enzyme that altogether catalyses the hydrolysis of beta(1-3) and beta(1-4) galactosyl bonds in oligosaccharides as well as the inverse reaction of enzymatic condensation and trans-glycosylation. This domain is made up of 16 antiparallel beta-strands and an alpha-helix at its C terminus. The fold of this domain appears to be unique. In addition, the last seven strands of the domain form a subdomain with an immunoglobulin-like (I-type Ig) fold in which the first strand is divided between the two beta-sheets. In penicillin spp this strand is interrupted by a 12-residue insertion which forms an additional edge-strand to the second beta-sheet of the sub-domain. The remainder of the second domain forms a series of beta-hairpins at its N terminus, four strands of which are contiguous with part of the Ig-like sub-domain, forming in total a seven-stranded antiparallel beta-sheet. 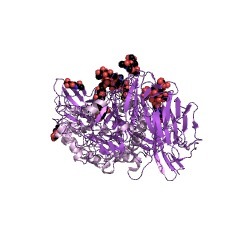 This domain is associated with family Glyco_hydro_35, which is N-terminal to it, but itself has no metazoan members. This entry represents the second domain of the five-domain beta-galactosidase enzyme that altogether catalyses the hydrolysis of beta(1-3) and beta(1-4) galactosyl bonds in oligosaccharides as well as the inverse reaction of enzymatic condensation and trans-glycosylation. 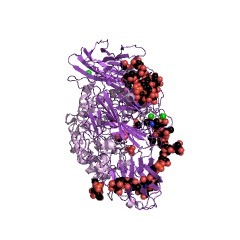 This domain is made up of 16 antiparallel beta-strands and an alpha-helix at its C terminus. The fold of this domain appears to be unique. In addition, the last seven strands of the domain form a subdomain with an immunoglobulin-like (I-type Ig) fold in which the first strand is divided between the two beta-sheets. In penicillin spp this strand is interrupted by a 12-residue insertion which forms an additional edge-strand to the second beta-sheet of the sub-domain. The remainder of the second domain forms a series of beta-hairpins at its N terminus, four strands of which are contiguous with part of the Ig-like sub-domain, forming in total a seven-stranded antiparallel beta-sheet. There are 354 BetaGal_dom2 domains in 353 proteins in SMART's nrdb database. Taxonomic distribution of proteins containing BetaGal_dom2 domain. This tree includes only several representative species. The complete taxonomic breakdown of all proteins with BetaGal_dom2 domain is also avaliable. Click on the protein counts, or double click on taxonomic names to display all proteins containing BetaGal_dom2 domain in the selected taxonomic class. Crystal structures of beta-galactosidase from Penicillium sp. and itscomplex with galactose. Beta-galactosidases catalyze the hydrolysis of beta(1-3) and beta(1-4)galactosyl bonds in oligosaccharides as well as the inverse reaction ofenzymatic condensation and transglycosylation. Here we report thecrystallographic structures of Penicillium sp. beta-galactosidase and itscomplex with galactose solved by the SIRAS quick cryo-soaking technique at1.90 A and 2.10 A resolution, respectively. 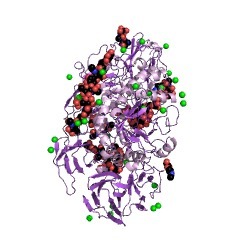 The amino acid sequence ofthis 120 kDa protein was first assigned putatively on the basis ofinspection of the experimental electron density maps and then determinedby nucleotide sequence analysis. Primary structure alignments reveal thatPenicillium sp. 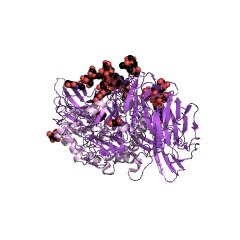 beta-galactosidase belongs to family 35 of glycosylhydrolases (GHF-35). This model is the first 3D structure for a member ofGHF-35. Five distinct domains which comprise the structure are assembledin a way previously unobserved for beta-galactosidases. Superposition ofthis complex with other beta-galactosidase complexes from severalhydrolase families allowed the identification of residue Glu200 as theproton donor and residue Glu299 as the nucleophile involved in catalysis.Penicillium sp. beta-galactosidase is a glycoprotein containing sevenN-linked oligosaccharide chains and is the only structure of aglycosylated beta-galactosidase described to date. 1tg7 Native structure of beta-galactosidase from Penicillium sp.